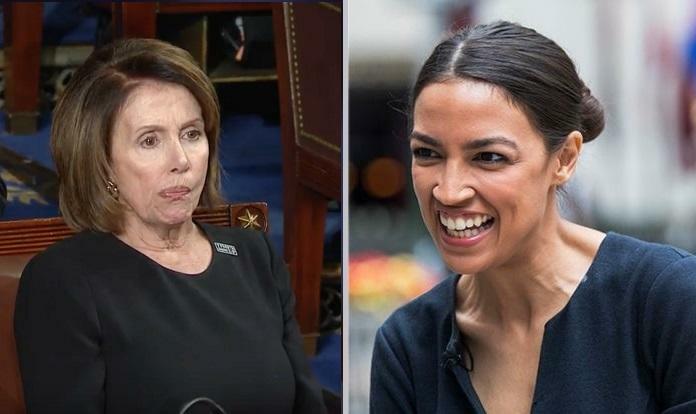 Nancy Pelosi (D-CA) flipped her dentures at the "new face of the Democratic Party," Alexandria Ocasio-Cortez (D-NY), as the freshman congresswoman unveils the final draft of her ambitious "Green New Deal" legislation. "It will be one of several or maybe many suggestions that we receive," Pelosi told Politico on Wednesday before Ocasio-Cortez released the plan. Pelosi's comments come after the 29-year-old Ocasio-Cortez was excluded from the new Select Committee on the Climate Crisis. Ocasio-Cortez is rolling out the "Green New Deal" with Sen. Ed Markey (D-MA), which she says calls for a "national, social, industrial and economic mobilization at a scale not seen since World War II and the New Deal," and is "a wartime-level, just economic mobilization plan to get to 100% renewable energy." The plan also aims "to promote justice and equity by stopping current, preventing future, and repairing historic oppression of indigenous communities, communities of color, migrant communities" and other "frontline and vulnerable communities." Ocasio-Cortez's plan, which has several doesn't outline specific policy proposals (they'll "work it out" we guess), and promises grandiose measures using broad brush strokes such as achieving "net-zero greenhouse gas emissions through a fair and just transition for all communities and workers. Everybody gets a job, clean water, healthy food, and "access to nature," whatever that means. Former Vice President and terrible prognosticator Al Gore has thrown his support behind the plan, saying in a statement that it marks "the beginning of a crucial dialogue on climate legislation in the U.S."
"Mother Nature has awakened so many Americans to the urgent threat of the climate crisis, and this proposal responds to the growing concern and demand for action," said Gore. "The goals are ambitious and comprehensive – now the work begins to decide the best ways to achieve them, with specific policy solutions tied to timelines."